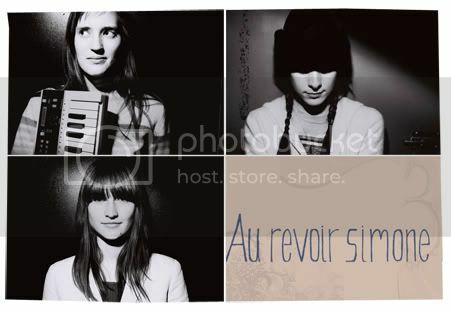 When I first heard ‘Sad Song’ by Au Revoir Simone, I thought they were French, literally, what with all the name and electronic music and everything. Turns out they’re an all-girl band based in Brooklyn, New York using solely synthesizers and drum machines as their main instruments. think that the song was created for the show but it was the song that came first before the show was aired. The video for ‘Sad Song’ - the single will be released on the 28th of May - has finally been uploaded on YouTube, and it turned out to be very simple. I guess because the video was so simple, they tried putting in effects by slowing the song when they shot it so that when it was edited, the clips can be fast-forwarded (is that the correct term?). Hence the fast animated video. It isn’t the best video I’ve ever seen; in fact I think I could’ve done it better. But, it’s definitely better than your typical videos on MTV (think Beyonce) and more entertaining to watch than the ever so dull music videos that we have here in Malaysia. Why doesn’t anyone ever think of that? Baking cookies, rather than doing nothing whilst sitting and being pretty in a hotel room. The video’s a bit weird, yes I have to agree. But, at least it’s not ‘sick -weird’ like Marilyn Manson so to speak. Au Revoir Simone reminds me of the phrase ‘humble musicians’ who makes music just to feel – complete, inspired and happy. Great track review by The Anchor Center. Genius Idea.